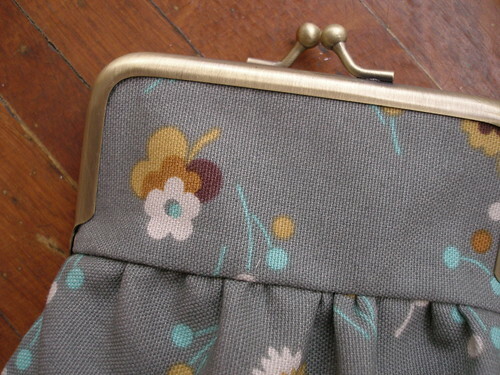 I just wanted to gush a little over the darling little coin purse I made in a class taught by Reva on Sunday. Figuring out how to make these purses with the metal frames was on ‘my crafty list of things to do’, so I was delighted when Reva proposed this as a class at the workroom. I used fabric from Denyse Schmidt’s new line ‘County Fair’, it’s a heavier canvas weight perfect for home decor and accessories. The lining is a print of antique coupons by Anna Griffin. These little purses use very little fabric, so you can make a few from just a fat quarter or make good use of your scrap stash. With all the different sizes of frames in the shop, I see a matching token purse, sunglass case and clutch bag in my near future. Ooo brilliant, it looks so professional, great fabric choice too! I have just started reading your blog, I found it through a friends blog. I love your little coin purse! wowie! everyone did so well! the fabrics are amazing! karyn – you sell coin purse frames now? or is it just for the class. I’ve had the hardest time looking for them! i love the fabric choices, karyn! especially the lining. i might just get a fat quarter like that! and oh yes, are you going to start selling coin purse frames from now on? i’m loving the gentle hum of the new sewing machines btw 🙂 my sewing machine sounds like a race car compared to your berninas. Rats, somehow I missed that class! Will there be another one, do you think? Hi Becky & Heather – thanks for stopping by, it’s nice to meet you! Rosalyn – yep, i’m now selling a range of purse frames. i’ll be posting photos of the ones i get in the shop here. Melissa – i’m ordering even more purse frames today, so you can count on them being in the shop from now on. i’m glad you’re liking the berninas, they’re so amazing to work on! Jennifer – i’m scheduling a few more sessions in the next calendar, this class is going to be a permanent fixture at the workroom. it’s such a fun and satisfying project. do you offer your coin purse class on line? i live in colorado and need help on figuring out how to attach a metal frame to a purse. do you glue it or crimp it or what??? christina – i’m working on a kit to do the coin purse, but it will take me a while to get it together. i actually do both though… glue & crimp. there are also other frames you can get that require you to sew in the metal frame! thanks Karyn, please let me know when you have your kit ready or post it to this site and I’ll keep checking. I want to get this figured out ASAP. are there instructions somewhere that you know of and could point me to? I just stumbled across these photos on flickr and I’m in love! If you do decide to offer an online class/kit, I’d definitely be interested! Love your blog and creativity!